The bottle crafting community has grown exponentially this past year so we decided to give away several different prizes instead of just one. If you are one of our lucky Bottle Crafts Giveaway winners you will receive a book plus one of the other prices. :) How Awesome is That?!? On Wednesday, Dec. 17th, 2014 we will select not 4 but 6 lucky winners! Our good friend Ray from Creator’s Stained Glass Inc. graciously offered to send 1 – Creator’s Bottle Cutter and 1 – Creator’s Bottle Neck Cutter to two of our giveaway winners. That’s over $200 in prizes alone. Simply share this article to your favorite social media site(s) and leave us a comment below. You may leave multiple comments. The more you interact and share this article, the better your chances of winning will be. One prize package per winner, chosen at random! Bottle Craft Book – a thorough introduction to Recycled Bottle Crafting. Complete with practical information and full color photograph. This guide will introduce you to the craft, class and beauty of lighted bottles. With easy to follow instructions, over a dozen decorating ideas and bottle craft inspirations, you will be able to make your own bottle lamps and recycled bottle crafts in no time. The Glastopper – use any beer bottle necks and turn them into the perfect little shot glasses. Or use a larger bottle and turn the neck into a unique drinking glass. The GlasTopper is dish washer safe and comes in clear and black. Up-cycle your Bottle Necks into Glasses! Jabiru Bottle Top Stems – this little gadget creates a new up-cycling opportunity with your cut bottles. Create personalized and unique goblets and glasses with your cut off bottle tops! 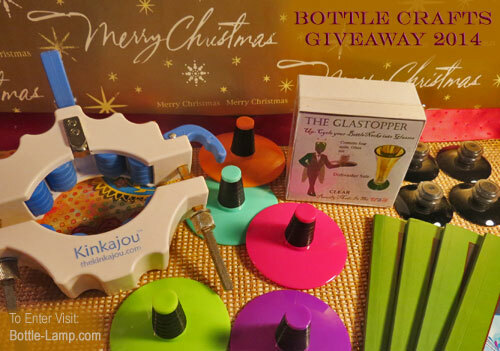 Kinkajou Bottle Cutter – the perfect tool to help with many up-cycling projects. With an amazing success rate, the Kinkajou makes it easier to get that perfect score line that is essential for a clean glass separation. It can be used to turn bottles into personalized glassware, lamps, vases, candle holders and so many other things. Creator’s Bottle Cutter – creating art with re-purposed bottles is easy. The base is made out of a durable molded polycarbonate. Positioning the cutter head is simple with the ruler marked in both inches and centimeters. Simply place a bottle or jar in the jig and turn with the palm protector helping to reduce slipping. Only light pressure is needed to produce an ideal score. Creator’s Bottle Neck Cutter – simply set the stabilizing plug in the bottle opening, adjust the height of the score by turning the knob, hold the sides of the cutter firmly and then rotate the bottle while applying pressure. It’s that easy! Please share our Bottle Crafts Giveaway with your friends and leave us a comment below with your current email address. This contest is open to everyone in the U.S.! 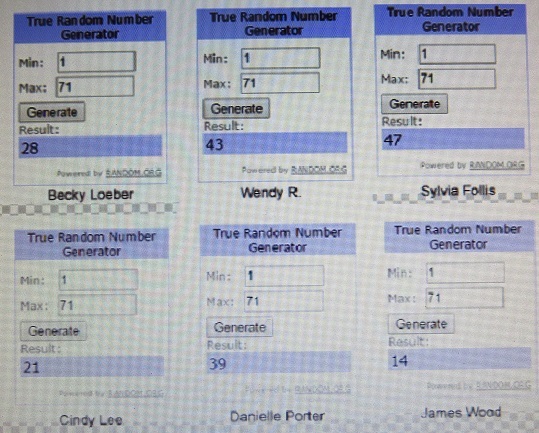 The lucky winners will be picked using random.org and contacted via email. All the winner have been notified via email. I’ve just started trying to cut bottles and this prize would surely help me. This is awesome. I would love to have this!How about you Jackie Garletts? I need all the help I can get! I’ve made light filled bottles, now I’m ready to move on to something bigger. Love your sites! to go. I am seeking the glass topper or Jubiru at craft stores in time for Saturdays vegetarian wine bottle cutting gathering…..
manageable, malleable tool..and the entire project is Awesome! Great! repertoire of craft work. Many many thanks! Fabulous to become Facile in Bottle Cutting!!! Most helpful are the videos and intriguing to find the website..very involving! Sweet! I shared your giveaway on my FB and G+ pages. Thank you! I am following you (gladly!) on Pinterest via my http://www.pinterest.com/artists4god/ account. God bless! I also liked you on FB as Rose Santuci-Sofranko. Thanks so much and God bless you and yours! And…I have subscribed to you on You Tube as Artists4God (I hope I was supposed to do a separate comment her for each thing I did?) God bless! My dad and I tried bottle cutting when I was child. I love your videos. They bring back happy memories. I would love to win and try it again. I love the idea of upcycling bottles! Fantastic! Finaly going to get started and will rely on your wealth of knowledge. Thanks for being a clear voice for us to follow. A friend sent me this link because she knows I am warning to start making bottle lamps since I had to quit working due to health problems and now I will be spending a GREAT deal of time at home. I’m looking forward to checking out all of your Pinterest posts and everything you have to offer!! It would also be great to win this great gift to get started with but even if I don’t I’m so glad she led me to this site!!! Thank you for all of the great information!! I hope I did everything right in signing up lol. I would love to win these for my mother. She makes bottle lights for her friends and family and she really enjoying doing it. I try to keep her drill bits and equipment up to date so she won’t have too much trouble with making her stuff. She would be thrilled to have anything that would help her make even more bottle lights for the people she loves and cares about. Thank You so much for post such a fun thing to do with bottles. I have watched and learned so much in just my first year. Everyone gives me bottles and are so shocked to see what they get back. It is a true joy just to see the faces as I return their bottles. Done thank you for the chance. You are doing a wonderful job of sharing your art. I have started this exciting hobby of bottle recycling and am loving it. I hope to be one of the lucky winners! Thank you, Liked your page on facebook, by me and my page Handmade with class. I have just started to cut bottles. Having a great time and this would be so helpful! Great giveaway!! Thank you for doing what you do and for all of the great advice and help I have gotten from you!! Thanks!!!!! Love your videos and ideas. What a great community of repurposed bottle crafters! Thank you! Such a great community of repurposed bottle crafters! Thank you for making this available! Great ideas! Thanks for the opportunity! If you check out my fb page, you will see that I excel in altering bottles into works of art – but, sadly I do not have a bottle cutter or anything to make them into lamps or to install lights in them – this prize would be greatly appreciated! I have seen these and would love to try my hand at it! Awesome giveaway Dude! Shared on my FB page. I hope win that bottle cutter! That would be Sweeeeeeeeet. So many great ideas and would love to have the tools to create awesome gifts. Just shared on FB and hope to be a winner!! I’ve been saving blue wine bottle for a while to make something exciting! Have no clue what yet! This looks like fun! I have been recycling bottles for quite a while and love seeing the creative ways people have shared with you. I, also, enjoy the U-tube videos and all the helpful information you share. I have pinned your site and liked you on facebook. Thanks for such a great site. Just ordered the Kinkajou and can hardly wait for Christmas to come! Great holiday giveaway!!! Did not know you was on FB!!! Liked and shared! Thanks for all the great ideas and support throughout the year! Wishing you guys a Merry Christmas & Happy New Year! Awesome give-away! Great for those of us just getting in to the craft! Any of these would be awesome to win. I’d absolutely love to win one of those bonus prizes. I already have a kinkajou, however it has its drawbacks. Good luck to everyone! These prizes are so awesome!! Appreciate your site and have been sharing stuff on my Facebook page. Thanks. I didn’t know you guys had a Youtube channel, I’m checking it out now. Thanks for the give way and good luck to all the entrants! I follow you on Google+ and shared this giveaway. Our Giveaway is now officially closed! I have just returned home following a family emergency. The package arrived safely. I am looking forward to using the book. There are ideas I haven’t tried, but have wanted to do so. The jabiru are fun. I am so excited. Thanks again for the prizes. Share on facebook, I would like to participate into the giveaway, thanks! !